Business Management Software for Meal Prep Companies! Train with retired NFL All Pro Kicker Mike Hollis and the man who taught him everything he knows, NFL Kicking Coach Jim Gaetano! CLICK HERE to see all the wonderful recommendations for Mike Hollis and ProForm Kicking, ranging from former NFL players, to current and former PFKA students, to successful businessmen! "ProForm Kicking Instructional Video Series - DVD"
CLICK on this text to be directed to the informational and ordering page. CLICK HERE�for more details and�registration! 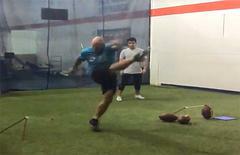 "ProForm Kicking has taught me how to kick the right way. I knew that if I wanted to reach my full and untapped potential, I would have to become completely open to change. I saw the ball going higher, straighter, farther, with less effort and more control after just a few lessons. If your just starting out or an old dog looking to change, then look no further. It wasn't easy but I sacrificed what I knew and put faith in the form. Mike and Jim have added years to my career, with the form I'm confident enough that no one can compete. Do not rely on your own abilities rely in the Lord, he will guide you in your life and your kicking. Be patient and enjoy your journey!" -Nick Novak-- NFL kicker currently with the Houston Texans. Nick has also spent time with the San Diego Chargers, Washington Redskins, Arizona Cardinals, and Kansas City Chiefs. CLICK HERE FOR SOME MORE GREAT TESTIMONIALS! Perspectives from a Retired NFL Kicker with Mike Hollis. From the NFL to Entrepeneurship (SportsEpreneur.Com Podcast). Eleven On Eleven - Mike Hollis In a 2018 offseason jaguars.com series featuring 11 former players talking about 11 current players, former Jaguars kicker Mike Hollis talks with digital reporter and host Ashlyn Sullivan about the Jaguars’ 2017 success, the current state of the special teams unit and the team as it moves forward. Another great mention by NFL Kicker and ProForm Kicking Academy student Nick Novak...giving credit to ProForm Kicking! Click Here for the great article! ProForm Kicking Student, and 2014 Fred Mitchell Award Winner (top kicker in the nation - all levels below D1), Sergio Castio hits game winning FG for the Winnipeg Blue Bombers in CFL debut! NEW...ProForm Kicking Instructional Videos! Click Here to purchase specific kicking/punting fundamental video clips, or purchase the entire series! Join our mailing list! Click Here to submit your info. "Kickin it with Retired NFL Kicker & NCS Kicking Coach Mike Hollis"
A great message from the father of ProForm Kicking Academy's female kicker Erika Clark! Mike Hollis: A Matter of Form. Check out the athletes who are traveling from all parts of the country to work with ProForm Kicking Academy in Jacksonville Florida! Click Here! "ProForm Kicking Academy teaches kicking and punting techniques that are NOT common among many other kicking camps out there! Even NFL athletes say that ProForm Kicking's technique is 'the most unique kicking and punting philosophy' they've ever seen! We are VERY detailed and teach the most productive and efficient kicking and punting fundamentals that will, without a doubt, make ANY dedicated and disciplined kicker and/or punter successful at ANY level!" Mike Hollis, Retired 9 Year NFL All-Pro Kicker. detailed kicking, punting, and long/short snapping academies in the nation. With the ability to train within a private environment inside a 55,000 square foot sports facility, all athletes can train year around...despite the weather conditions! This environment also allows the athlete to focus on form and technique, maximizing the potential for perfecting their swing. Unlike many other camps out there, ProForm Kicking Academy focuses on the many very specific attributes that are involved within each swing of the kick. Much like the golf swing, there are a number of problematic issues that need to be addressed on a consistent basis. It takes very experienced coaches to identify each of these specific movements and correct them when needed. The ProForm Kicking coaches have 35+ combined years of recognizing proper and improper movements within the kicking and punting motions...not only by visually seeing them, but by experiencing them as well. Both coach Hollis and coach Gaetano have kicked thousands of footballs at ALL levels of football and have learned to identify and correct any problems they have encountered. That is what separates an average kicker from a great kicker...and ProForm Kicking Academy will assist in that transformation! Please Check out our Partners and Affiliates!!! For ALL your kicking equipment needs!